A judge has ruled that Team Lotus can continue to race under that name. The High Court ruling in a case brought by car company Group Lotus confirms the team headed by Tony Fernandes as the owner of the Team Lotus badge. Group Lotus, which sponsors the Renault team, retains the right to use the Lotus marque on its road cars, and in F1 if it chose to enter its own team. Group Lotus says it will appeal against the ruling that two teams could have Lotus in their name. It's a victory for Team Lotus and Tony Fernandes in that they can continue to use the Team Lotus name in Formula 1. Group Lotus will clearly be disappointed but at least this allows them to continue in F1 as sponsors of the Renault team. Group Lotus, owned by Malaysian car company Proton, is concerned this aspect of the judgment simply causes confusion in the eyes of spectators and the wider public. The judge rejected that claim. 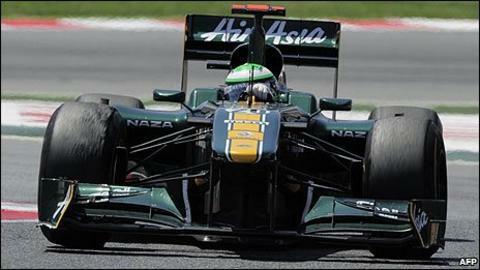 The court case was lodged by Group Lotus in an attempt to prevent Fernandes using the Team Lotus name in F1. Fernandes initially entered F1 in 2010 using the name Lotus Racing, under licence from Group Lotus, which had made it clear to Fernandes that it did not own the rights to the name Team Lotus. But the two parties fell out. Lotus Cars decided it wanted to enter F1 on its own and agreed a sponsorship deal with the Renault team for 2011. It terminated its licencing agreement with Fernandes, who bought the rights to the Team Lotus name from businessman David Hunt - brother of 1976 world champion James Hunt - in 2010 in an attempt to protect his investment. The Malaysian airline entrepreneur was keen to stress the links between his new team and the historic Lotus, which was founded by Colin Chapman and won a series of six drivers' titles and seven constructors' championships through the 1960s and '70s. The saga deepened when both Team Lotus and the Renault team - now officially renamed Lotus Renault GP - decided to race in the iconic black and gold Lotus livery, only for Fernandes to ultimately decide to stick with the original green and yellow colours. The complex issues of the so-called "Lotus versus Lotus" row were finally resolved in London's High Court on Friday, with both sides counting the verdict as a victory. In short, Team Lotus were allowed to continue running under that name while Group Lotus will keep the black and gold livery. The judge also ruled that Group Lotus was entitled to end that licence agreement in 2010 and that, consequently, Team Lotus must pay damages for breaching that agreement. "We are all pleased that it has been clarified that we are the rightful owners of Team Lotus," said Fernandes. "We have always been confident that the factual evidence we presented would lead to this decision and today's judgment confirms that belief. "We are delighted that we can turn our attention to ensuring success for Caterham Cars on the road and Team Lotus on track. "Now our main aim is to add more history to the incredible story of Team Lotus over the coming months and years." Group Lotus head of legal, Sarah Price, commented: "Group Lotus is pleased that its right to race under the Lotus name in F1 has been upheld and that the defendants' attempts to stop that have failed. "The ongoing dispute with Team Lotus and associated companies has been a cause for concern for all at Group Lotus. "Despite the detailed judgment there are issues which still require clarification and we remain committed to obtaining this much-needed clarity for the many fans of the Lotus marque - we are extremely grateful for their continued support. "The decision to appeal has not been taken lightly." The ruling recognised that Team Lotus have the rights to call their cars "Lotus", under the terms of a 1985 agreement between Group Lotus and Team Lotus. That means Fernandes can continue to race his cars under that name.